The crew on board the sunken Henry VIII ship the Mary Rose was from the Mediterranean, North Africa and beyond, researchers have found. Bone structure and DNA of 10 skeletons found on board were analysed by team at Cardiff and Portsmouth universities. They said four of the skeletons were of southern European heritage, and one seems to have hailed from Morocco or Algeria. The findings cast fresh light on the ethnic makeup of Tudor Britain. The Mary Rose sank in 1545 in the Solent during a naval battle with the French, with the loss of between 400 and 600 lives. Dr Nick Owen headed the team at Swansea University which used photogrammetry - a method of producing high definition, photorealistic 3-D images - to visually analyse the remains. "Having studied the skull of one of the men who went down with the Mary Rose, we found the bone structure was consistent with someone who had North African features, and DNA evidence seems to back this up," he said. "Today, with a much more mobile world population, it would have been harder to isolate, but in the 16th Century it's easier to pinpoint facial characteristics to a specific location. "Henry, as we've named him, had a broad nose bridge and wide cheek bones which are far more similar to skeletons found in Morocco or Algeria than those of the indigenous British population of the time." While sailors were, even then, much more mobile than the population as a whole, Henry does not appear to have joined the navy from abroad. By analysing oxygen isotopes in his teeth, and levels of sulphur, nitrogen and carbon in his bones, the team discovered that he was brought up in the south of England. "By the time our adult teeth form, the chemical evidence of the food and water in our environment is locked in, and in Henry's case it's clear that he grew up around Portsmouth, the Mary Rose's home port," Dr Owen added. "I'm a scientist not an historian, but it does question a lot of the assumptions we've previously made about how diverse the Tudor population was." The precise cause of the Mary Rose's sinking has never been identified, though the most common theory is that additions made to the ship in 1536 caused her to sit lower in the water, and thus allowed water in through the open gun ports as she turned in battle. The wreck was raised from the seabed in 1982. The analysis of the remains also reveals the crew were better fed than the population as a whole, but due to the lack of variety in their diet, most suffered from conditions such as rickets and scurvy. Some of the skeletons studied also showed bone abnormalities in the arms which suggested they had been archers. Researchers collaborated with the Mary Rose Trust on the project, which features in a Channel 4 documentary. 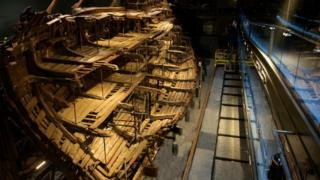 The findings form part of a major new exhibition at the Mary Rose Museum in Portsmouth, including 3D printed facial reconstructions of several of the skulls.